Sammi Whelen smiles while running up the field during Indian River’s 0-4 loss to Delaware Military Academy on Thursday, May 30. The Indian River High School girls’ soccer team certainly earned everything they got this season. They earned their Henlopen Conference South Division title. They earned their spot in the Henlopen Conference championship game against Caesar Rodney. They earned their first two wins in the DIAA Division II girls’ state playoffs. And they earned the respect of Delaware Military Academy — their semifinal opponent in the DIAA state playoffs last Wednesday, May 30. 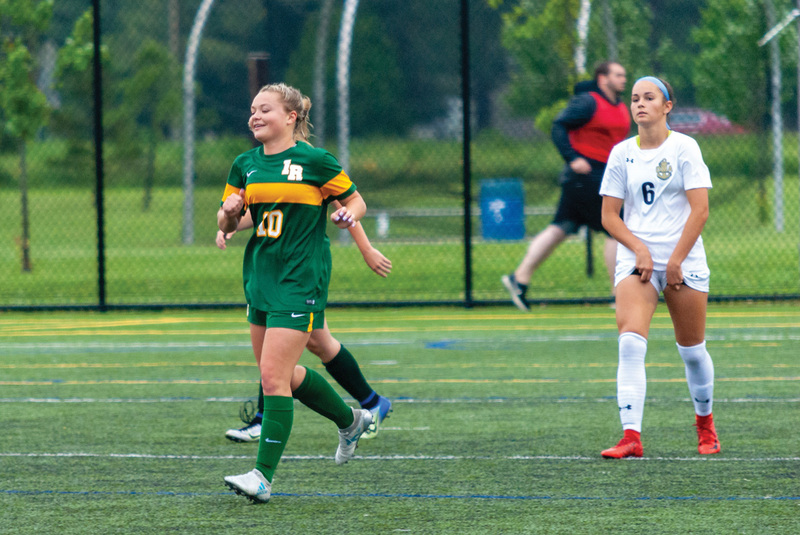 In fact, the Indians battled, scratched and clawed their way through an unusually chilly, rainy late May evening against the Seahawks, to a scoreless tie through the first 40 minutes of action. Despite that effort, the Seahawks responded in a big way after the intermission and wound up winning convincingly, 4-0 over the Indians. At the 41:30 mark of the game — just 90 seconds into the second half, on a set corner-kick play — Elise Buonopane took a pass from teammate A.K. Hughes and drilled a shot passed IR goalie Fabrea McCray into the lower right corner for a 1-0 lead. Not even five minutes later, IR’s Sia Diakos took a pass from Izzy Binko and nearly tied the game. However, DMA goalie Julia Emerich somehow was able to corral Diakos’ shot before it crossed into the goal to thwart the tying opportunity. And it was almost as if in that moment, any momentum the Indians had picked up quickly blew away with the wind. DMA would go back down the field and generate a free-kick opportunity from about 20 yards out, with Buonopane again doing the damage to make it 2-0 at the 47:00 mark. Buonopane figured into the scoring of DMA’s last two goals, assisting on Alyssa Ruggieri’s goal at 61:00 before helping on Melayna Immediato’s marker at 65:00. DMA outshot the Indians 12-5 and held a 6-2 advantage in corner-kick opportunities on the night. Emerich finished with five saves for the Seahawks, while IR senior Fabrea McCray made seven stops. Free kicks: Indian River won’t have to wait long for a chance at redemption after a look at the preliminary schedule for 2019 shows the Indians facing the Seahawks in their first game of the 2019 season. The Indians finished their 2018 campaign with an 11-6 overall mark. DMA went on to defeat Tower Hill in the state championship final, 1-0, to finish their season at 15-2-1.